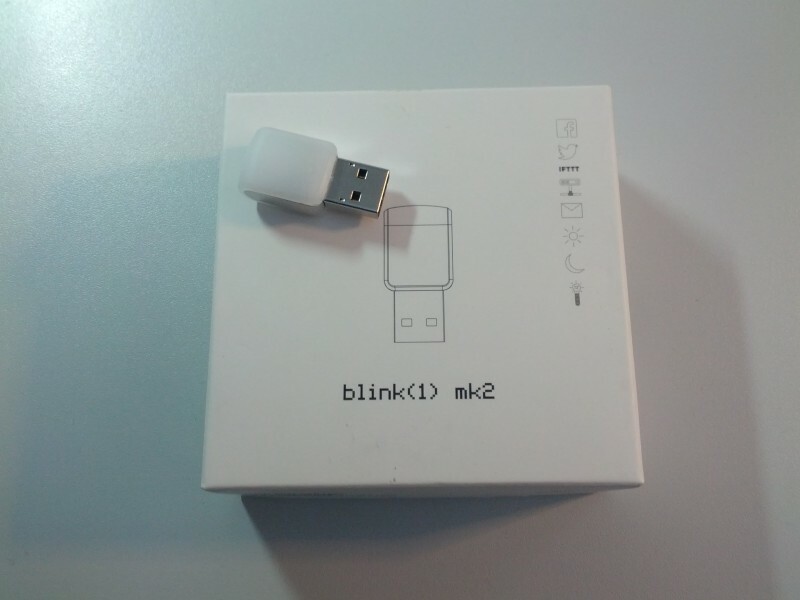 Got myself a blink(1) mk2 gadget to play with. It is currently set up to alert me to new emails with different colours for the different accounts. This is done using the Mailbox Alert add-on for Thunderbird and the blink1-tool command line tool. Very good instructions may be found on this wiki. Unfortunately, after enabling the blink(1)_mk2 notification in Thunderbird as described above, my entire system started to freeze up when I got email. Not every time, but repeatedly. I don’t have time to sort it out at the moment, so I disabled the Mailbox Alert add-on in Thunderbird for the moment. The problem has thus gone away, but it remains unsolved. The Mailbox Alert add-on may not be necessary, since I believe Thunderbird has message filters that can be set on the inbox, and which can run a command when new mail arrives. I tried this, but the problem persisted. Therefore, I believe the problem lies with the blink1-tool command line tool. Does anyone else have similar experiences, or maybe even a solution? I am open to suggestions. Panasonic CF-51 Toughbook: No sound or hotkeys. If you ever find yourself in front of a Panasonic CF-51 toughbook running Windows XP, you may encounter the following situation. You installed all the latest updates from the Panasonic website, but neither the sound nor the hot-keys work. If you check the hardware-manager, you may find an unknown device left over, which upon closer examination, seems to have something to do with the ACPI. I believe it was called “ACPI MAT0019”. It is in fact the Panasonic hot-key device for which the driver wasn’t installed correctly and which you have to install manually. Before you go and install the driver for the hot-keys, be sure to check that you have installed the other two parts of the hot-key situation. The correct order seems to be to install the hot-key app first, then the hot-key settings application and finally the driver. You can find the driver and other applications on the Panasonic website or alternatively you may want to look here. To install proceed with the manual installation, you go to the hardware manager (System settings->System (select the hardware tab), then click on the hardware manager button). Select the unknown device, click on “Update Driver”, select the manual installation route and then select the folder to which you downloaded the driver. The installation should complete successfully and upon restart, the hot-keys as well as the sound should work. This presumes that not only did you installed the sound driver correctly beforehand but, if I remember correctly, the hot-key driver installation outlined above is the third step in installing the hot-key device. First you have to install the hotkey-app, then the hot-key settings and finally the driver as outlined above. SnOil, one of the coolest physics/art projects!! SnOil is a physical display based on ferrofluids designed by Martin Frey, a researcher and artist from the Berlin University of the Arts (or “Universität der Künste Berlin”, for those of us who speak German :). It employs ferromagnetic fluid and a matrix of electro magnets to create a display where the individual pixels are shaped by raising the ferrofluid above the electromagnets. How cool is that! You can play snake on it by using the built in tilt sensors! Check out the video on his website and see how it works.